As the number of children taking drugs for attention deficit and other behavior disorders rises, new figures show spending on those drugs has for the first time edged out the cost of antibiotics and asthma drugs. The dramatic rise from 2000 to 2003 in the use of attention deficit/hyperactivity disorder, or ADHD, drugs by children under 5 contributed to a 23 percent increase for all children, according to an annual analysis of drug use trends by Medco Health Solutions Inc., the nation's largest prescription benefit manager. Use of antibiotics grew only 4.3 percent over the same period, while use of antidepressants rose 21 percent and use of medicines for autism and other conduct disorders jumped 71 percent, according to an analysis of drug use among 300,000 children under 19. Medco culled the data from its customers' usage. Dr. Robert Epstein, Medco's chief medical officer, said 17 percent of total drug spending last year for the group was for behavioral medicines, compared with 16 percent each for antibiotics and asthma drugs, 11 percent for skin conditions and 6 percent for allergy medicines. "This is the first year that behavioral conditions have eclipsed all other areas, Epstein told CBS Radio News. "It certainly reflects the concern of parents that their children do as well as they can." 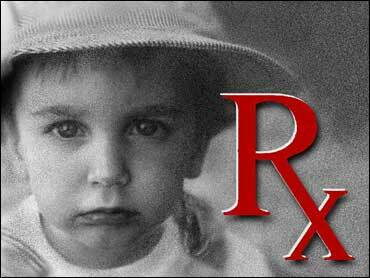 The most startling change was a 369 percent increase in spending on ADHD drugs for children under five. That's because of the popularity of newer, long-acting medicines under patent, compared with twice-a-day Ritalin and generic versions available for years. Drugs such as Strattera, Adderall and Concerta only require one morning dose, which helps keep children on an even keel all day and eliminates having to line up to get an afternoon dose from busy school nurses or day-care officials. Also, Ritalin and other versions of methylphenidate are controlled substances, requiring a doctor visit for each refill. Use of such behavior medicines has become controversial, with some experts questioning whether parents and school officials are too eager to medicate disruptive children. "It's not necessarily a bad thing that these medicines are being used more," said Dr. James McGough, associate professor of clinical psychiatry at the UCLA Neuropsychiatric Institute, because kids on ADHD drugs tend to avoid substance abuse and other problems and do better in school. Some can eventually stop taking the medicines and many function well if they pick a career that interests them. The side effects of ADHD drugs are mainly reduced appetite and growth. "I think there may be an initial overprescribing, but I don't think there's a continued overprescribing," said Dr. Richard L. Gorman, director of the American Academy of Pediatrics' drugs committee. Gorman said when parents agree to have a child try medicine for ADHD, "either it's better and everyone's relieved, or nothing happens, the kid's still wild and then the parents say to the school, 'We tried this stuff and it didn't work.'" Parents then either try another drug or end the treatment, he said. Estimates of how many American children have ADHD vary, from 3 percent to 10 percent. According to the National Center for Health Statistics, the number of children aged 3 to 17 with ADHD rose from 3.3 million in 1997 to 4.4 million in 2002. McGough said increasing adolescent use of antidepressants is a concern, because there's little proof they work in young people and evidence they may increase suicidal tendencies. Overall, 5.3 percent of children took some type of behavioral medicine in 2003, including 3.4 percent on ADHD medicines and 2.3 percent on antidepressants. Some children are on both types of drugs. That compares with 44 percent who used antibiotics at some point, 13 percent on asthma medicines and 11 percent who used allergy drugs. Use of asthma medicines increased 15 percent from 2000 to 2003 and use of medicines for gastrointestinal problems jumped 28 percent, mainly due to new drugs for the stomach gas that gives babies colic. Franklin Lakes, N.J.-based Medco negotiates drug price discounts for insurance plans, processes members' electronic prescription claims for retail pharmacies and ships medications from its mail-order pharmacies. Medco said average monthly spending per member was still lowest for those 19 and under, $12.31 a month, compared with $125.58 for those 65 and older. However, the average cost of a daily dose for one medicine was much higher for children than for senior citizens — $2.12 per day versus $1.29 per day — because many more generic drugs are available for conditions of the elderly.